As far as characters in "Saturday Night Live" skits go, they don't come much thinner than the Butabi brothers, the head-boppin', disco-king wannabes portrayed by Will Ferrell and Chris Kattan. A Night at the Roxbury follows the myriad of dismal SNL spin-offs that have justifiably been cast onto the dungheap, which includes It's Pat, Stuart Saves His Family, Coneheads, Superstar, The Ladies Man, and others. How I've described them above is all of character development shown in the skits, and that's all they have to show in the movie, too, but this time, for better or worse (usually the latter) they actually talk. The plot in A Night at the Roxbury has the brothers desperately wanting to...well...get into the Roxbury, an exclusive nightclub. The problem is that they are overgrown losers who still live at home with parents Dan Hedaya and Loni Anderson and who carouse the club scene, dancing like epileptics to Haddaway's song "What is Love?" and generally being a nuisance to all of the female patrons. 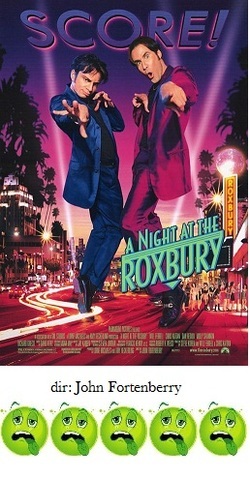 The whole success of A Night at the Roxbury hinges on just how inherently funny you think these guys are, since the script sounds as if it were written via an Etch-a-Sketch and the film's entire story arc involves Ferrell and Kattan being annoying to everyone around them and to each other. This is as deep as these characters ever get. So, will they finally get some respect and get into the exclusive club? For me, anyway, all of this is the very definition of underwhelming. The movie bores so completely I can barely muster enough energy to loathe it. Granted, I didn't feel actual, physical pain while trying to get through it as I did with It's Pat or Superstar, but that's not saying a whole lot in A Night at the Roxbury's favor. In fact, I'm putting far more energy and effort into trying to critique A Night at the Roxbury than director John Fortenberry, producers Lorne Michaels and Amy Heckerling, and screenwriters Steve Koren, Kattan and Ferrell, collectively, put into making it. And now I shall promptly forget all about it.